"An easy, healthy chicken dish with a special sweet and sour tang! Goes great with rice and salad." Place chicken in a 9x13 inch baking dish; sprinkle with onion, garlic, seasoning, soy sauce and sweetener. Place foil over pan and bake for one hour at 425 degrees F (220 degrees C). It's ready to serve! This 600-calorie meal includes tangy chicken, salad, and angel food cake. The taste was good, I didn't give it 5 because it takes MUCH less time than what the recipe says- mine was perfect after just 35 minutes. 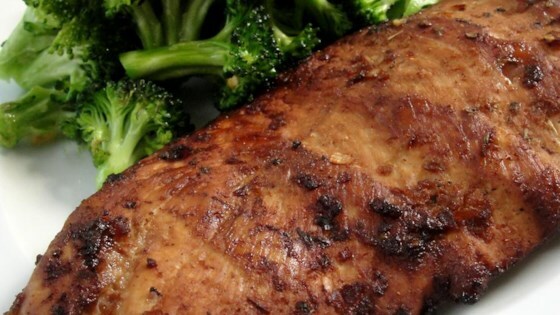 I tried this recipe with leg quarters and it was a very tasty meal with a salad. I liked it very much.